​When the last whistle sounded on Sunday's final, France's on-field players dropped to their knees in joy. However, one stalwart of Les Bleus team would rise from the bench to celebrate his side's victory. Uncharacteristically poor against Croatia, N'Golo Kante had been substituted on the 55th minute for Steven N'Zonzi. With France holding a slender one-goal lead, Didier Deschamps decided to remove his most consistent performer. Some would suggest it was a risky decision. Ten minutes later, the French were up 4-1. How could the manager feel Kante was struggling? Maybe it was because he had walked in his shoes. 20 years ago in Paris, Deschamps was captain of the team that brushed aside a star studded Brazilian line-up 3-0. Not bad for a water carrier. A team needs balance. Kante may not be as fashionable a player as Paul Pogba or ​Kylian Mbappe, but without him they could not succeed. Eric Cantona may have been a football savant, but understand Deschamps' management he does not: "The quantity of talent and potential France have is just insane. "But why is all this talent not on the pitch when it really matters? It is mind-boggling. A great coach is being judged on his ability to find a tactical system where his best players can all express themselves at the same time. That will not happen when you are being coached by an accountant rather than a visionary." Unfortunately for Cantona, his genius never saw a ​World Cup. The accountant of Deschamps has two winner's medals. Since catapulting himself onto the world stage in ​Leicester City's shock ​Premier League winning campaign, Kante has gone from strength to strength. The PFA Player of the Year in the 2016/17 season, the diminutive midfielder was an integral piece of the ​Chelsea side that reclaimed the league title. Never a complainer, Kante plays with a smile on his face. He could have made excuses for an apparent gastroenteritis bug he had been suffering with on Sunday, or thrown a strop when substituted. That's not the attitude of a water carrier. If we are to truly understand Kante's importance. history lessons are a must. Case studies of Chelsea's French and Italian links, combined with domestic tactical development in the ​Serie A should get us there. Gianfranco Zola, Marcel Desailly, Roberto Di Matteo. Continental names who made a long lasting imprint in west London. However, this story isn't about them. In 1999, Gianluca Vialli bought Didier Deschamps and Chelsea won the FA Cup. When 2003 rolled around, Claudio Ranieri signed Claude Makelele and back-to-back Premier Leagues titles followed. Most recently, it was Antonio Conte who bought N'Golo Kante in 2016. By the end of that season, the Blues had recorded the most ever Premier League wins. Quite the coincidence. Italian football heritage has transcended the decades, with principles of Catenaccio living on in the tactics of Jose Mourinho and Diego Simeone. Helenio Herrera's Grande ​Inter of the 1960s made it fashionable, winning the '64 and '65 European Cups. Adapted from a 1930s system called Verrou, Catenaccio translates as door-bolt. Seen as a defensive tactic, it helped Italy narrowly win the 1968 European Championship on home soil. They beat the Soviet Union on a coin toss in the semis, before defeating Yugoslavia in a replayed final. Although Celtic's 2-1 victory in the 1967 European Cup final proved that adventurous football could still win the day, Internazionale continued with their Catenaccio style for another five years. That was until the competition of '72, where they faced a Cruyff inspired Ajax. Tactically destroyed, Totaal Voetbal crushed Catenaccio for the outdated garbage it had become. A 2-0 triumph could've easily been much more. A year later, it was. The Amsterdam club bludgeoned Inter's cross town rivals ​AC Milan 6-0 in the European Super Cup's second leg. Italian football needed to change, and it would. In the next few years of Calcio Italia, the portatore d'acqua was born. ​Juve's Giuseppe Furino, AC Milan's Romeo Benetti, and Inter's Gabriele Oriali began to rise. A new archetype blossomed, as midfield play elevated its level of creativity. In Turin, Furino played to Roberto Bettega. The red side of Milan saw Benetti allow Gianni Rivera opportunity to create. Inter watched on as Oriali acquiesced Evaristo Beccalossi's forays forward. 40 years on, that pioneering play has become the norm. Kante was responsible for 61 tackles in the French rise to tournament success. It was one of Les Bleus most important statistics. For the majority of the knockouts, France mainly played on the counter attack, with turnovers a plenty. They didn't mind launching up an audacious lofted ball from defence, because they knew Kante would win it back for them. Against Argentina, Belgium and Croatia, France's possession was less than 40%. Catenaccio may have died in the 70s, but some of its principles still hold true. While a water carrier may be seen by many as anti-football, it is essential for nearly all teams. We cannot be blessed by a world where every team plays like Pep Guardiola's ​Barcelona. It could be suggested that it's even harder to get it right on the national stage as well. Where Brazil of 1970 succeeded, their flamboyant all-stars of '82 did not. The Netherlands teams of '74 and '78 may have made it to two finals, but could never bring back football's greatest prize. They came closest in 2010, but this time, their renowned play style was adopted by the opposition. Spain's dream team handed Holland a third final loss. Whether France were the best team in Russia or not; they won. In conclusion, not everybody can be ​Lionel Messi or ​Cristiano Ronaldo. 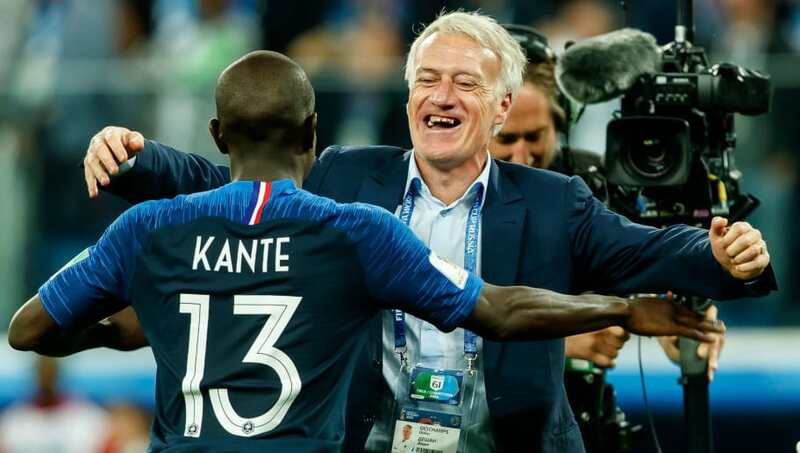 Ask those two giants of today's game if they'd like Kante playing alongside them internationally, and the answer would be yes. If this World Cup has shown anything, it's that trequartistas and fantasistas could win you a game, but only the water carrier would win you a championship. From Oriali, Furino and Benetti to Deschamps, Makelele and Kante; the portatore d'acqua lives on.